My favourite geek is coming to a screen near you. 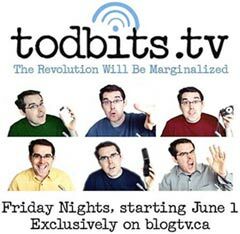 Starting June 1, Tod Maffin is hosting a live video show on blogtv.ca. According to the Todster, it's about personal technology, and will feature 45 minutes of live call-in (via computer) every Friday night. Tod says he has funding from Alliance Atlantis for the web TV show, which will include visits to various technology companies across Canada. One thing's for sure: there's nothing on regular TV Friday nights to compete. Dave Traynor wants to know what the technology present is, mentioned in my last three posts. For Christmas this year, I got a Nokia E61 smart phone, but as I alluded in the last three blog posts, the phone is somewhere between Toronto and here. ETA is today, the first business day since the package was last sighted in Ontario. I'm pretty pumped about this, partly because I'm into technology gadgets, and partly because I'm hoping it will reduce the amount of time I spend in front of a computer trying to recreate the ideas I had earlier in the day or week. Kelley and I have been experimenting with chosen presents lately. We still get each other surprises, but often big purchases that are a bit of a luxury get wrapped into Christmas, birthday or anniversary. Does knowing what's coming spoil the fun? Not really, because it's precisely the thing I wanted. There's still plenty of room for surprise and delight in our lives. The bad news - the present that was supposed to be here for Christmas was shipped to the greater Toronto area, where it's been languishing for two days. The good news - it's very close to my great-grandmother's birthplace of Stouffville, Ontario. Minnie March grew up in the Whitchurch-Stouffville area, and ended up moving to Saskatchewan with her new husband David Curtis. 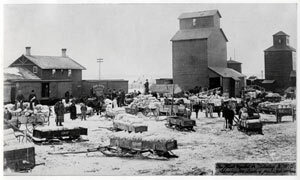 They ran a dry goods store in Wolseley, then moved to Findlater, southeast of Regina, where he was badly injured while working in a grain elevator. They ended up living at 2039 Retallack Street in Regina, about seven blocks from our house. If the package takes a short detour on the way to Regina (and why not, it's already gone far enough from here), it can swing by where the old family farm was. The map on the right shows a red star where my package was at 3:37 this morning. Merry Christmas to the March family relations in and from Stouffville. I've never visited, but I'm not dead yet, so you never know. The package will eventually go through Wolseley, which was a little different when Elsie was born there in 1903. For one thing, it was still part of the Northwest Territories then. Saskatchewan didn't become a province for another two years. Here's a shot of the grain elevators in early Wolseley. My grandparents briefly ran their store in a triangular brick building that's now a credit union branch. My mom sometimes talks about her aunt Susan, who married into the Banbury family in Wolseley. 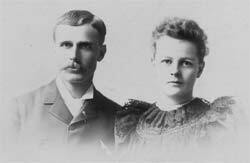 Susan's husband Robert was related to Edwin Banbury, a co-founder of Beaver Lumber. I've got a few March family photos from the turn of the last century on Flickr. Thanks to the University of Saskatchewan archives for the photo. Whenever I lose something, I kick myself for not doing a better job of labelling it, so the finder can return it, if they're so inclined. The sticker I put on my digital camera last year doesn't guarantee it will get returned, but it makes it easier for someone to be a good samaritan if they find the camera. I also added a cash reward, so if someone does return the camera, they'll get about 10% of the value of the camera as thanks. And here's the best part. Trackitback has a dirt cheap shipping price for people who aren't in a hurry to get their stickers. Plus, they billed my credit card in Canadian dollars, saving me the currency conversion fee I get charged when I pay in US dollars. A no-brainer for a Canadian company to let its customers pay in their own currency? You'd think so, but there are plenty of companies that don't give you the option. I have no idea when the Stocking Stuffer Special ends, but there's a $30 5-pack also available. Even at the regular $10 per sticker price, Trackitbacks are worth it, if they save you replacing even one electronic gadget in your arsenal. And yes, I do believe there a lot of people out there who would return a lost camera or laptop if they found it. Just check out the overflowing lost and found boxes in stores, schools and other public places if you don't believe me. Trackitback is franchised in most English speaking countries, plus Portugal and Mexico. 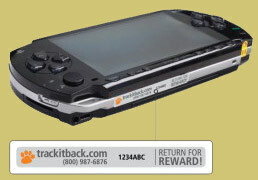 Items found in any country in the world will be returned, if the finder contacts Trackitback. In the tradition of unconferences, there will be a BarCamp in Saskatoon at the end of the month. I don't even know if I'm going, but I'll spend tomorrow thinking about what I might present if I do go. BarCamps are a great chance for people interested in technology and new media to talk to each other, share their enthusiasm and knowledge, and spend time with interesting people. If you haven't checked out the Saskatoon BarCamp site and the wiki, go now. The price is right. It's free. Anyone who's been to more than a couple of conferences can tell you the most valuable sessions are in the hallway, or in the bar, chatting and arguing with other participants. Yet most conference promotions maintain the myth that the keynote speakers and the panel discussions are the reason to pay vast sums of money to attend. So it was refreshing to read a recent blurb that came across my Inbox from the Momentum Growth Conference, coming up in September. The exclusive conference is for the best of the best of media companies and hot technology firms, venture capitalists and tech journalists. "During the two-day conference, we will explore the exploding digital convergence ecosystem from a bottoms-up and top-down perspective as the Momentum companies and market leaders such as Yahoo!, Google, AOL, MSN, News Corporation, Qualcomm, Nokia and others discuss and debate issues such as copyrights, advertising, emerging business models, and the importance of picking the right partners." Bottoms up: interjection. Friendly remark said before starting to drink alcoholic beverages. Bottom-up: adjective. Of an approach to a problem that begins with details and works up to the highest conceptual level. Now that's my kind of conference! The first time I started our Xbox I couldn't believe the incredibly noisy start-up sound that emanated from the TV speakers. Obviously, the design team never tried to catch a quick video game at 2 a.m., while everyone else is asleep. > monitoring the reactor core. Thanks, Microsoft, for such an annoying experience that I will always associate with your product. Now, the company is planning to hard-code a start-up sound into the long-delayed Windows Vista operating system. Now even the geeks won't be able to disable that Windows trill, as they boot their laptops during a conference, meeting, phone call, symphony recoding session, or whatever. On Scoble's blog, the decision is described as part of the Vista "brand experience." Some design decisions are so anti-customer, it's hard to describe the stupidity behind them. As Gnomedex organizer (with Ponzi Indharasophang) Chris Pirillo notes, there are times when a conference is priced low enough for media to afford the full fee, and organizers don't need to give them a free or reduced pass. But anyone who doesn't have built-in buzz from bloggers (see gnomedex on Technorati), or some other method of motivating their target market to action, will still want to comp enough media to keep their conference in the news (most conference coverage is promotion for your next conference). Pirillo has depended on media coverage in the past, and likely will in the future. But he also has the reputation and network to get the word out on the conference. He and Ponzi run a well-oiled promotion machine for their projects, so someone considering raising barriers to free media access would do well to think about the profile the Seattle tech mini-magnate has created for his global microbrand (to borrow a phrase from Hugh MacLeod). Pirillo and Ponzi have put in a huge effort at building an audience, establishing relationships in the technology field, positioning him as the ultimate early adopter with a positive attitude, and making sure something cool happens at the 400-person Gnomedex conference every year. There are no simple shortcuts to that kind of reputation. There's nothing wrong with suggesting themes or story ideas to journalists. They feed off of that sort of input, even if they don't use your specific suggestions. However, telling them what not to write just gets their backs up. I've followed up with journalists to propose that revealing too many how-to details of a robbery victim's security set-up helps other robbers more than it helps the public. But I wasn't telling them they shouldn't write about the robbery. When Apple sent their handlers to help tech journalist Tom Yager understand how misguided he was in pursuing a story, they tried to convince him he was pursuing a topic that was so obscure no one cared about it. Isn't that what the editors are supposed to decide? It's frustrating when the story you want journalists to write about is being ignored for the scandal of the day. Or even worse, when a journalist seems to be on a vendetta that zeroes in on one point of view to the exclusion of all others. Organizations can argue with writers and their editors about what should and should not be the focus of editorial coverage. But a complaining phone call can feed the fire, instead of putting it out. It's not a question of ethics. Complain all you want. Just don't underestimate the stubbornness of journalists when they're told that a topic shouldn't be pursued.